This web page is the latest updated method and was provided by TRex, a frequent visitor to the Big Green Egg Forum. This is his method for preparing strip steaks. If you have any comments regarding this information, please contact TRex via the forum. This information is posted with TRex's permission. Revision 3 notes from TRex: It was back in 2003 that I first transcribed some ideas that I had about cooking a steak on the Egg. I was a young, neophyte Egger, ready to conquer the world, one sear at a time. I stated quite a few things very matter-of-factly, even though I didn�t really know what I was talking about half the time (funny how age � and a few unsuccessful cooks � can humble a man). I must thank my friend David Welch for teaching me about beef. Thanks to his inspiration, some experimental determination, and � yes � some luck, I managed to stumble upon a technique which I believe delivers good, consistent results. I have quite frankly been surprised and humbled by the number of folks that agree with me, but I am happy that I have managed to contribute something to this community. When I first started using this method repeatedly, I was cooking mostly NY Strips; thus the method was dubbed �TRex�s Strip Steak Method.� Although strips are still my favorite cut, I have found that this method works well on all thick cuts of beef (where �thick� is ≥ 1.5�) and even thick pork chops. 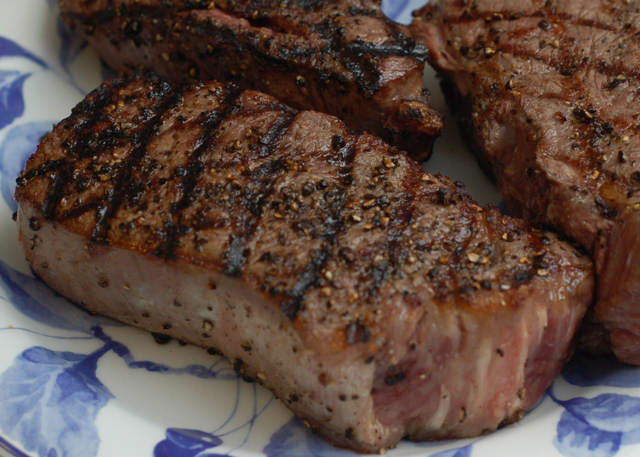 Thus, in revision 3, I have edited out my insistence upon buying strip steaks � yes, my palate has broadened as well, thank goodness. Also, as one can imagine, I have tweaked and even deleted some steps. I picked many of those changes up in revision 2, which was posted a couple years ago. There are some additional clarifications that I will provide in this current revision. For instance, you can�t buy prime strips for $10.99 anymore anywhere that I know of, and since having left Corporate America to join the ranks of teaching, I can be quite happy with Choice grade beef (I can�t afford to be as snobby as I used to be). I�ve also tried to consolidate some of the narrative and say things more succinctly when possible (I know, hard to imagine). Finally, nobody saw fit to tell me how horrible the pictures were in the original write-up. I�m not sure that any of them were in focus, the lighting was horrible, and frankly the steaks themselves did not look very appetizing the way in which they were photographed. I�m sure I turned several folks away just by my poor photography alone, not to mention my tact for being longwinded. Well, I have since become a bit better with the camera, and so I have tried to pick some shots from various cooks that appeal more to the eye and appetite. Oh, one more thing. Thanks to all my fellow Eggers who have essentially � with my dad�s help � taught me 98% of what I know so far about cooking. And thanks, Whiz, for continuing to host this way-too-long narrative on your site! My favorite cut of beef is a top sirloin strip steak--these tend to have the perfect combination of marble (for taste) and tenderness. If you can afford to, I recommend buying the BEST stuff: Prime or Angus beef. But time has taught me to look more at the meat itself than the label � a lot of times you can find a well-marbled cut of beef that is labeled as �Choice.� Also, make sure the steak has some flexibility to it when it�s raw � if it isn�t tender raw, it�s not going to be tender cooked. Beware of meat that is on sale � just be smart about what you pick up - I have experimented with buying cheaper meat just because it was cheaper and folks, carefully cooked crappy meat results in cooked crappy meat � often tough, fatty, or not very juicy. 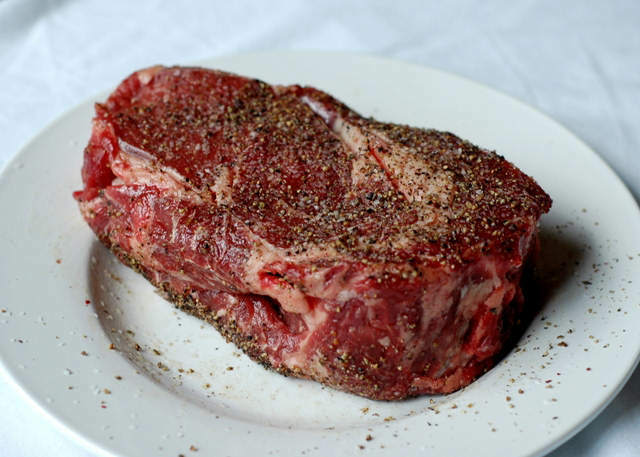 I�m not saying that you can�t find good meat on sale, but often the meat that is on sale is on sale for a reason � just ask my dad about the $5.99/lb standing rib roast. I do firmly believe that 95% OF A GOOD STEAK DEPENDS ON THE MEAT YOU START WITH. If possible, get the butcher to cut you a fresh steak about 2" thick (to be picky, these days I ask for 1.75�)--you certainly don't want it any thinner than 1.5� � if thicker, you'll just have to add to the cooking time. Simple is the key here. You want to enhance the natural flavor of the beef, not add a lot to it. So get some Kosher salt, coarse ground black pepper or use fresh peppercorns in your own pepper mill, and olive oil. I don�t recommend wood CHIPS; I always buy wood CHUNKS. Chips just tend to catch on fire too easily and char whatever you're cooking. I use Mesquite when I do steaks because it has a strong biting flavor that goes great with grilled beef. 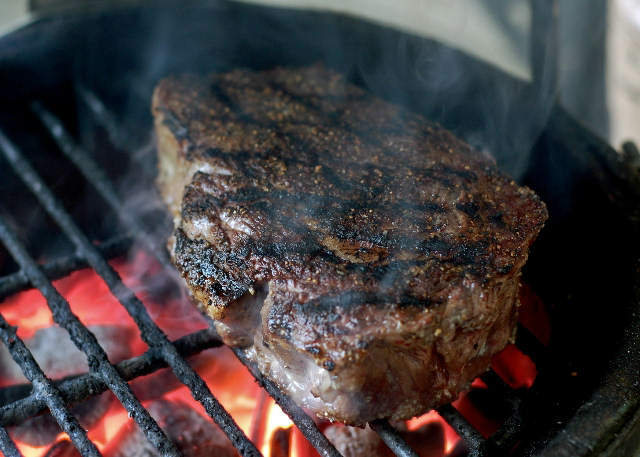 Also, since the smoke is strong, this allows for its flavor to be absorbed during the relatively short time the steaks will be exposed to the smoke. Also, don�t soak your wood chunks � there is no need. Because water evaporates at a lower temperature than the volatile organic compounds in the wood that gives the smoke flavor, your wood chunk will lose most if not all of the water it contains before giving a nice, clean smoke (think of when you�re trying to burn wet wood in your fireplace). You�ll be using a couple of fist-sized wood chunks for this cook. (As you well know, good cooking comes to those who wait.) If you can be patient enough, it is best to let the meat come to near room temperature before doing any searing/cooking. What I usually do is set the meat out for thirty minutes to an hour (if it's still cold, it's not room temperature, unless you�re in a really cold room�you know what I mean). In my previous writeup, I don�t think I stressed enough the importance of letting your meat come to room temperature. After a handful of experiences with rushed steak cooks (i.e., I went straight from the fridge to the Egg), I�ve concluded that cooking a cold steak will result in a less tender, less juicy steak. Quite simply, you have to expose the outer thickness of the steak to heat longer while you�re waiting for the center to come up to your �done� temperature. This longer exposure will obviously cook your steak more, so you may end up with a medium-rare center but medium or medium-well steak most of the rest of the way through to the outside surfaces. Yes, it requires even more planning and patience, but believe me, it does make a noticeable difference�let your steak �warm up� before you warm up that Egg! Jack London died long before the Egg had gained popularity in the New World, but man would he have appreciated this experience. Building a good fire took me a couple of weeks of practice. I only met success once I learned the secret: patience. As you might have perceived by now, cooking with the Egg is an experience, a journey�not a quick 21st century mouse-click. It usually takes me about 10-15 minutes before I have brought the Egg to life. What does this look like? Hot, yellow glowing coals, or, as my buddy Cameron says, �glowing lava.� You don�t want to see much black. Now, all 15 of these minutes are not spent standing by the Egg (although, with a nice single malt, I highly recommend it). The last 5 or so you�re just letting the coals turn into lava. Okay, so, how do you start? There are competing methods used to make a fire in the Egg�the BGE forum suggests a few, the Whiz gives you some good pointers on this website, and I�m sure your owner's DVD suggests a method as well. Feel free to use whatever method you like, but I�ll share with you a couple of methods that have worked well for me. To start the fire, I used to use those self-striking starters which I found at Kroger. They appear to be wood particles held together by a paraffin binder. You can get them at most grocery stores I believe. You can also use those lighter cubes called Encendedores�they work well, but I would use two. The important thing is not to use a huge starter piece that will take forever to burn away. The self-striking starters (which are like 5�x2�x0.5�) work really nicely, if you can get them to self-strike. Before you light your starter piece, put two small, skinny long pieces of lump on the bottom of your fire box. (The firebox should be clean and your grill grate is off at this point.) You will essentially be making a bridge between these two pieces with your starter piece�hence, they act as shims to let air flow underneath your starter piece to help it burn more efficiently. Now, make sure your bottom air vent is completely open. Light your starter piece and hold it vertically (I use tongs) so that the fire climbs it and the entire piece catches on fire. Now, make your little bridge across the two small pieces of lump. Next, starting with large pieces of charcoal, make a pyramid on top of the starter pieces�just 5 or 6 pieces. Let these get burning well, then start to add more charcoal, 5 pieces or so at a time (more as the pieces get smaller), taking care not to smother your flame. You can gradually use smaller pieces of charcoal as you fill the firebox. Before each addition of charcoal, make sure the previous pieces have started to catch somewhat and that you have a nice flame to set the new pieces into. Continue this process until you have filled your firebox above the level of the airholes and up to the bottom of your firering. This sounds like a long process, but it�s not. If you�re as impatient as me, though, you can go buy one of those MAPP gas torches, which is all I use these days. MAPP gas burns hotter than propane, and works really well to light your lump. Just stack your unlit lump as stated above until you have filled your firebox to the bottom of your firering, then light your MAPP torch and hold it in 4 or 5 places for about 30 seconds in each place. Then, just walk away for a bit and your fire should start going. Whichever method you use, you may want to blow air into the bottom vent to facilitate the combustion (I use a small hand-held fan, I�ve heard of some people using hair dryers, which add the extra bonus of preheating your air prior to combustion). This can often cut your start-up time in half (I once brought my Mini up to almost 900 F in under 5 minutes using a handheld fan). 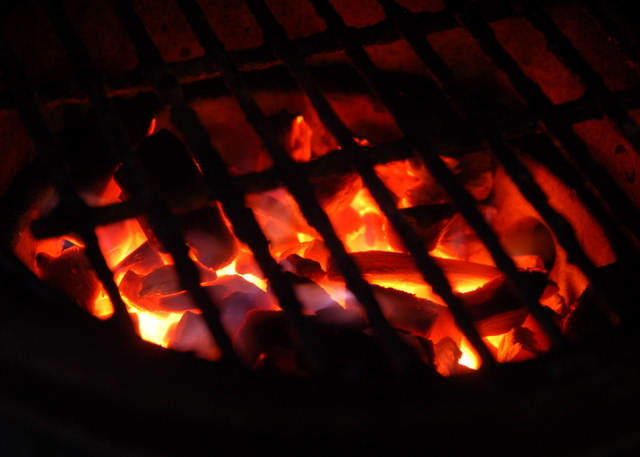 Once you have a filled firebox with a good flame (not a smoldering mound of charcoal), you can leave the bottom vent open, replace your grill grate, close the Egg, leave the top vent completely uncovered, and walk away. It usually takes me at least 10 minutes or so to get to this point. Now, you�re trying to get lava temperatures in order to do your sear, so that is why you want maximum air flow. You may want to go prep your meat at this time (see Prepping the Meat) or wait about 5 minutes and then go prep your meat. After about another 5-10 minutes after closing the Egg, you should return to find glowing charcoal inside and probably some flames shooting out of your chimney and a temperature guage that is approaching 750° F, which is about where you want it (a little higher is better) to do your sear. If you smell gasket melting, you are ready to sear your steak (okay, the gasket comment is a joke � see the Whiz�s research on gasket temperature). I usually prep the meat about 5 minutes before throwing it on the Egg (if you prep too early, the salt may remove too much juice from the meat, although you DO want some moisture drawn to the surface to aid in the chemical reaction that occurs during the sear to give you a nice browned exterior). Your Egg should be roaring at adiabatic flame temperatures right about now, so get out your Kosher sea salt, coarse ground pepper, and olive oil. Drizzle some olive oil on each side of the steak, then GENEROUSLY shake an evenly-dispersed coating of Kosher salt on one side of the steak. Okay, what does this look like? Well, cover the surface of the steak but don�t pile salt on salt. Remember, a lot of this falls off during the searing process. Now, work the salt into the meat with your fingers. I do this until I can no longer see any white in the salt. Also, work some into the edge of the steak. Next, grind a generous amount of black pepper onto the surface (not as much as the salt, but a decent amount�I usually do about 20-30 turns of the pepper mill). Work the pepper into the meat just as you did the salt. Flip the steak and repeat the salt and pepper. Now you�re ready to sear. 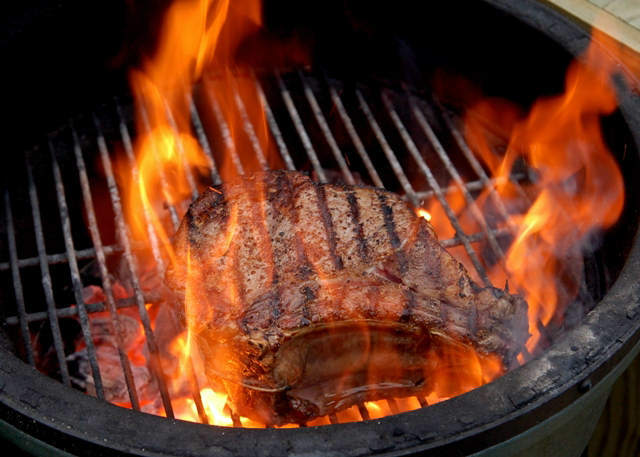 Okay, you�re about to start handling a hot steak over an even hotter grill. I learned the hard way that the tools you use to handle the meat are very important. I�ll go ahead and tell you that, if I can, I always handle the meat with my hands, even pulling it off of a hot skillet or grill. But, if you have to use a tool, DON�T USE A TOOL THAT CAN PUNCTURE THE MEAT. While spearing the meat is the easiest way to pick it up, this creates holes in the meat from which priceless juices escape while cooking. If I don�t use my hands, I use tongs or a spatula. I guess I prefer tongs since the spatula tends to scrape the rub off the meat. Your meat should be about room temperature now. If it�s still cool, that�s okay�you just don�t want it cold and stiff. Now, I've tried searing on the grill grate in its normal position, on the grill grate with the grate sitting basically on the coals, and in a cast iron pan that has come up to lava temps with the Egg. If you're into Char Crust, the skillet is your best bet, or even a cast iron grate. I didn't notice a big difference in how close the grate was to the coals except that it is just plain easier to sear on the grate in its normal position. (If you do use a skillet, use a cast iron skillet--don�t use a �nice� skillet. The first time I seared a steak I used our $100 Caphalon skillet and �converted� it into my steak-searing skillet. For searing in a skillet, you can put the skillet on the grill grate as you�re waiting for the Egg to come up to lava temps, and the skillet will follow suit.) Open the Egg slowly, and throw the steak onto the grill. Let it sizzle and smoke for at least a minute�I usually let it go 90 seconds. There will likely be flames all over the steak, but don�t start to panic thinking that you�re burning the crap out of your meat. It�s gonna sizzle and it�s gonna smoke like hell, and the seared side WILL get black in spots, but this will form the tasty crust of your perfect steak. After 90 seconds (if you�re brave), flip the meat (DON�T USE A FORK TO FLIP!). (If using a skillet and if the skillet is big enough, sear the other side of the meat in a different spot on the skillet so that you get a hot spot on the skillet.) After searing the second side, take your meat off the Egg and set it on a plate. When the smoke clears, you will see that you have a beautifully seared steak. Now, one thing I realized after people read my original write-up is that I hadn�t made it clear that I sear with the dome OPEN. The key here is that, during searing, all I care about is the radiant heat from the glowing coals and the conduction from the grill grate. Closing the dome would only limit the oxygen flow thus limiting the direct heat to the bottom of my steak. Also, this is a quick process � I�m not using the heat of the dome to cook the top side while searing the bottom side. I�m not saying that it�s wrong to sear with the dome closed, I�m just clarifying how I�ve always done it. Now, the second most important step�letting the meat rest. I learned this important tidbit from a friend of mine, David Welch, who has been a chef at several well-known steak houses, including Pappas Bros. in Houston. Meat is mostly muscle that will contract and tighten during the searing process (think of when you get a �knot� in your shoulder muscle). For a tender, juicy steak, you must let the muscle in the meat relax before you cook your steak at a lower temperature (think of a massage working the knot out of your shoulder). After much experimentation, I have found that the optimum resting time for a steak is 20 minutes. Any longer than this and the juices start to run out of the meat. 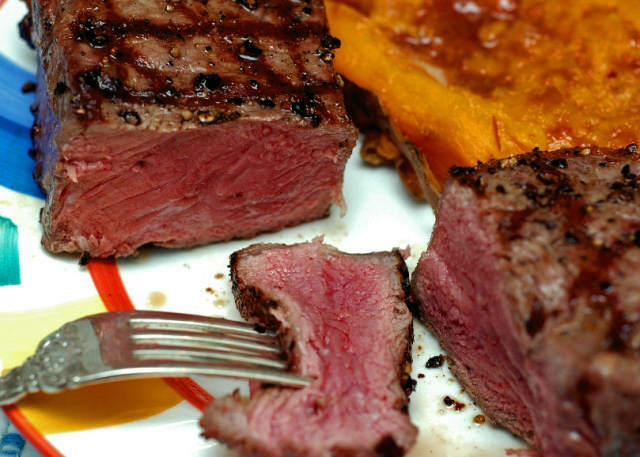 So leave the steak on a plate in your kitchen and walk away (if you have a dog, you may not want to walk away). After having seared your steak and while your meat is resting, you need to start bringing the Egg down to cooking temperatures. Close the bottom vent until it�s open about 1.5�. Close the top of the Egg and move your daisy wheel until about 1/8� of the top opening is exposed. Also, fine-tune the shutters on the wheel to about 25% open. Adjust your bottom vent to about �� open. Wait a few minutes and the temperature should begin to fall. Your target temperature is going to be 400° F. After 10 minutes of the 20 minute resting period have elapsed, pick out two fist-sized mesquite wood chunks, open the Egg, remove the grill grate CAREFULLY using tongs, place your wood chunks on the perimeter of the coals (not in the middle), and put your grate back on. Close the Egg. Let the Egg stabilize at 400° F. In another 10 minutes you should be getting either clear or clean, blue smoke, and your steak will be ready to go back on the Egg. Editor's Note: A recurring question is how to get the Egg to cool off in 20 minutes. This should not be a problem. I have personally seared steaks for 6 minutes (3 per side) at 800° and then put the rain cap on and closed the bottom vent. The Egg was at 400° after only 9 minutes, so you shouldn't have any trouble. Once it is at 400°, you can put the daisy wheel back on and open the bottom vent a little. Now the fun part. Just before doing the main cook on the steak, I may re-season slightly with the salt (lightly this time) and ground pepper on both sides. This step is optional and really up to your tastes. Now, take your steak outside. If your Egg is around 400° F and producing �clean� smoke, you�re ready. Open the lid quickly, throw on your steak, and close the lid quickly. Your temperature should stabilize back around 400° F, but if it goes a bit lower, don�t be too concerned�you�re cooking mostly by radiant heat from the coals; dome temp is not as critical, but just acts as a good gauge of how much radiant heat your coals are providing. Before going further, I want to clarify here that some people have referred to this roasting period as �dwell.� Well, dwell in the traditional sense means close both bottom and top vents completely. However, I still have bottom and top vents open during this period—just enough to maintain the 400° dome temperature. I�ve tried �dwelling� with all vents closed, but in my opinion that makes for a steak that is too smoky. Remove your steak from the Egg, let it sit for about 5 minutes under foil to redistribute the juices internally, then slice it thinly and enjoy. My hope is that you will experience the best home-cooked steak of your life, and probably a steak that is better than what you can get at most nice steak houses. ENJOY!